Mario Lemieux became the seventh player in NHL history to score 600 goals when he tallied into an empty net with a wrist shot from the top of the left circle with 56 seconds left in the Pittsburgh Penguins' 6-4 victory over the Vancouver Canucks. Ron Francis scored the go-ahead goal with 8:32 left in the third period and Vancouver's Jyrki Lumme had the apparent tying goal disallowed with 2:06 left. But Lemieux stole the spotlight by taking a pass on the left wing from Francis, skating the puck along the boards to the top of the left circle and feathering it into the net that was vacated when Vancouver pulled Kirk McLean for an extra attacker. Lemieux skated with his arms in the air after the goal and had a stoic look on his face until he got to the bench, when long cheers from the crowd eventually made him crack a smile. 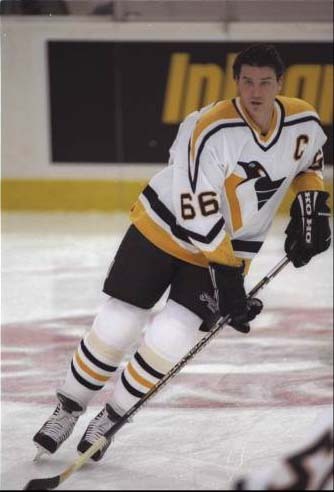 Mario Lemieux overcame both injury and illness to become the fourth active player to reach the 500-goal mark when he fired home a hat trick in Pittsburgh's 7-5 victory over the New York Islanders on October 26, 1995. Now, a little over a year later, in what may be his last season, Lemieux stands with 599 points, waiting to break the 600 mark just one game off Wayne Gretzky's mark of 718 games. Coming off a stellar performance in the month of January, named Player of the Month for this month, Lemieux has led the Penguins in assists and total points. Including a four goal burst in a single period on January 26th. In addition, Lemieux moved into second place on the all-time points list for an All-Star player, surpassing Gordie Howe in eight games. (Howe played in 15 All-Star Games) Over the course of his 12-year career, Lemieux has earned the respect of fans and players alike. Whether it was with his spectacular style of play, or his remarkable recovery from Hodgkin's Disease and back injuries. "I remember the day of his last chemo treatment, he went to Philly, he got there about 4 o'clock, and he went out there and he played. I think he's overlooked for what he's overcome. It's ridiculous. Everybody talks about Michael Jordan coming back from baseball, but Mario came back from Cancer. I don't think he gets enough credit." For whichever reason you choose, "Super Mario" has left a mark on the hockey world and its record books that will not soon be removed, and will never be forgotten. "It's a pretty special list. (the 600 goal club) You look at the names: Esposito, Marcel Dionne, Gretzky; to be included on that list is something I'll be able to cherish all my life," said Lemieux, who addressed his and Gretzky's career-long propensity for hitting empty nets. "Most of the time we'll be on the ice. You just have to wait, sit back a little bit; it gives you a good chance to score." 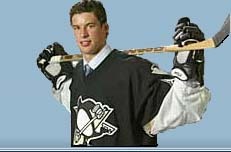 "Actually, I didn't feel to great tonight," admitted Lemieux, who has more than hinted that this is his last NHL season. "That's the reason I'm not going to Montreal. It's (Lemieux's back) been sore for a few days, it just didn't get any better." 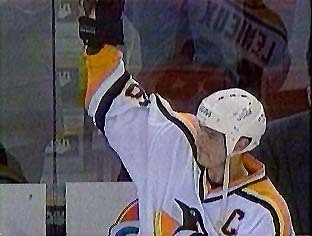 Ron Francis discussed the game plan for getting Lemieux the historic goal. "Certainly we were looking for him," said Francis. "We were working hard for him. We tried to get him that one opportunity early, he just missed the net. It's nice to watch Mario get goals -- but I sometimes like to pull out those Stanley Cup films -- but it was certainly nice watching that tonight." 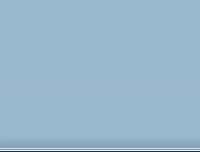 "It's nice to see 66 get 600. That's terrific," Penguins coach Eddie Johnston. "You tend to press, you want to get it over as soon as possible. It's great to have it happen on home ice."